For a long time, the fair trade community as well as the faith community have been aware of exploitation of vulnerable people outside of the U.S. Some Fair Trade businesses were organized specifically to rescue people from enslavement. Others are working to eliminate trafficking by attacking its causes. 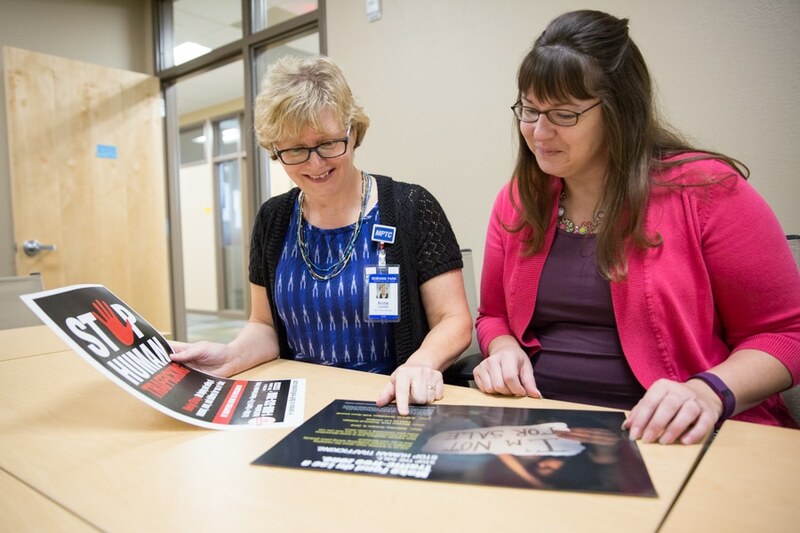 Nancy Irizarry is the Co-chair of the Wisconsin Anti-Human Human Trafficking Consortium. In the Fond du Lac area, through the Community Church, Nancy has organized summer conferences and numerous smaller gatherings to grow awareness. Nancy’s presentation on Human Trafficking Awareness Day in January, 2016 at the Fond du Lac Public Library had over 80 attendees. 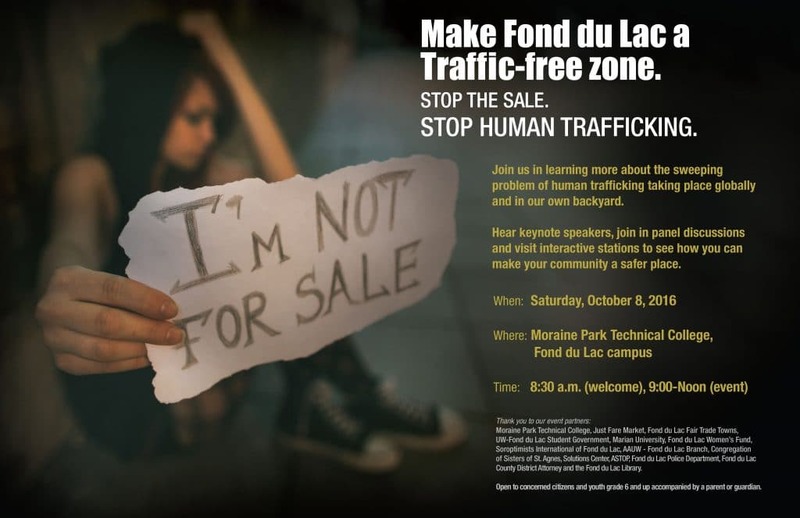 This energy led a group of representatives of local non-profit organizations to work together to plan “How to Make Fond du Lac a Traffic Free Zone.” This half day educational event will be held on October 8, from 9:00-noon at Moraine Park Technical College – Fond du Lac Campus. This event was specifically planned for October as a part of educational opportunities available during Fair Trade Month. Representatives from the American Association for University Women (AAUW) – Fond du Lac Branch, Congregation of the Sisters of St Agnes, Fond du Lac Fair Trade Town, Just Fare Market, Moraine Park Technical College, Soroptimists International of Fond du Lac, and the Fond du Lac Area Women’s Fund, have been meeting since January to discuss how to make this an interesting and informative event for the Fond du Lac community. Citizens and youth grade 6 and up accompanied by a parent are invited to gather at the MPTC cafeteria beginning at 8:30 on October 8. Participants will receive the program for the morning, some simple Fair Trade refreshments and may begin visiting the vendor and organization booths. The keynote speaker will be Elizabeth Marczak, Product Development Specialist for SERRV International, speaking on the topic, “What Fair Trade is doing to combat the Global Crime of Human Trafficking.” A panel discussion, focused on statewide and community efforts to combat trafficking, moderated by Nancy Irizarry and including representatives from ASTOP, Solutions Center, St Agnes Hospital, the Fond du Lac Police Department and the Fond du Lac County District Attorney’s office will follow. The remainder of the morning, will be an interactive “Stay Out of Traffic” experience. This will give opportunity to work through a possible human trafficking scenario by finding resources from local agencies who could help if you were in the situation presented in the scenario. Fair Trade vendors including Just Fare Market, Gallery and Frame and Living Light Studio, as well some of the nonprofit partner organizations will have booths to visit.